Whether you do it for fun, or you already do it to earn some extra money, you must know by now that a good home embroidery machine that makes all your ideas come to life is the thing to have. Let’s not forget that embroidery makes it also to fashion runways so you can never say a machine like this is overrated. If you are considering the cost aspect, keep in mind that a well rated embroidery machine surely compensate for the initial investment. Some machines bring amazing software to the table, state-of-the-art accessories and impressive overall quality. Other manufacturers develop machines that are very easy to use, for some specific jobs. Portability is also important for some of you, so it’s you to decide in the end what is the best home embroidery machine. You need to give a good thought about the jobs and main reason for which you buy the embroidery machine in the first place. Regardless of your budget, you can surely find the model that fits your needs the best. Just as long as your needs don’t grow too much over time, since many models bring a 25-year limited warranty. Step in the 21st century with an embroidery machine that brings to the table so many functions that ensure a fast and accurate operation every time. 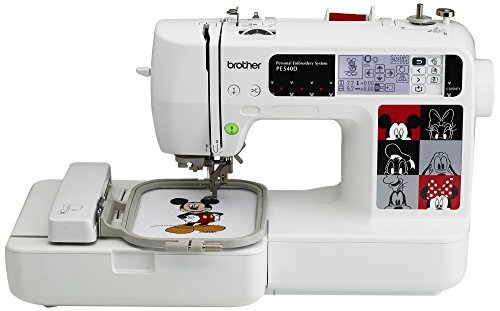 The Brother SE400 Combination Computerized Sewing and 4×4 Embroidery Machine is both a sewing and an embroidery machine which gives your projects an exquisite feel. The machine features 70 built-in embroidery designs, 120 frame pattern combinations and 67 built-in sewing stitches. You can get very creative while embroiling as the machine features 5 embroidery-lettering fonts also. The machine is a great choice for home embroidery, sewing or crafting and the 4”x4” embroidery area is of great use. The machine is a new era tool that you may connect to your computer. You may easily import or digitize some embroidery designs right from your computer. The list of functional features continues with the automatic needle threading system, which gives you speed and spares you from useless efforts. The touch screen LCD display is backlit, highly responsive and very easy to use. The Quickset drop-in top bobbin and the bobbin-winding system increase the easy use of the machine. It’s very comfortable embroidery/sew/craft thanks to the built-in push-button thread cutter also. The machine runs quiet and is jam resistant. It comes with English/Spanish operation manual that makes it all clear for you. The machine comes with multiple accessories and a very good price for its performances and convenient use. The issues aren’t major things for us and we think the machine is a good option for anyone looking for home embroidery machine that also is great for sewing. If you are dedicated to embroidery and are looking for a machine that is amazing on that, the Brother PE770 5×7 inch Embroidery-only machine with built-in memory seems to be a natural choice. The machine presents plenty of functional features that help you get as creative as you do want every time. The embroidery areas is pretty large (5”x7”) and gives you enough space to make your designs. You may have large designs and lettering and also combine them with minimal risk for rehooping. The machine lets you also see, edit your designs on the display before you actually stitch them. The LCD display touch screen is backlit, responsive and easy to use. The machine comes with 6 lettering fonts, 136 built-in embroidery designs, 10 frame shapes and 12 border styles. The designs also contain florals, scrollwork so you may get various, and unique designs. In addition, if you fear you may lose them, don’t as the machine presents also built-in memory. You may import your favorite designs from your USB memory stick with the USB port or memory card, with some help from the built-in card slot. When it comes to editing your designs before you actually stitch them, the machine is also great. You may rotate mirror image, increase or decrease the size of your designs, see how the future designs look on the LCD display before you stitch them. 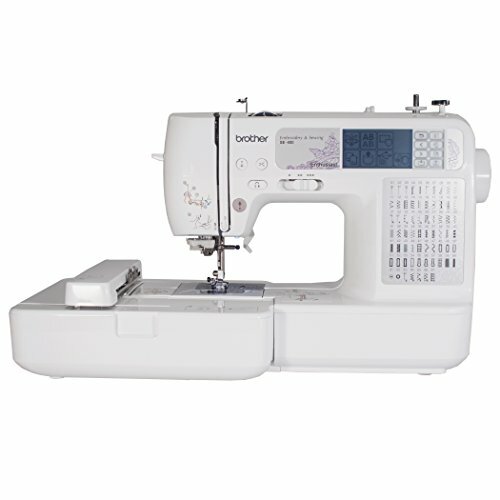 The list of features contains also the easy threading on top thread and bobbin, the auto thread cutter. The stitching is consistent and the thread trimming precise. The machine is iBroidery compatible, which means access to even more designs. It has a good weight so you may carry it around. It runs quiet and it’s reliable for long time. Despite the minimal issues, if embroidery means a lot to it, getting the machine may be of great use. When you like not only to do embroidery, but also to get very creative and have your own, one-of-a-kind tablecloths, the Singer XL-580 Futura Embroidery and Sewing Machine is worth the try. The machine helps you create multiple border designs on tablecloths, fashions and draperies. It comes with no less than 250 built-in embroidery designs, 215 built-in sewing stitches and 50 endless designs and endless hoop. The 5 lettering fonts increase your possibilities when creating. The sewing space for quilting is very large and when it comes to embroidery, you may create designs as big as 12”x12”. The embroidery hoop is also very large (10”x6”) and the machine features also multi-hooping ability. You get to embroider large format designs as tablecloths, dresses, bedspreads. A knee lifter for hands-free raising and lowering the foot’s pressure adds up when it comes to useful features on the machine. When it comes to comfortable use of the machine, we also have to remind the long arm design, which increases the sewing space when stitching quilts or various large projects. 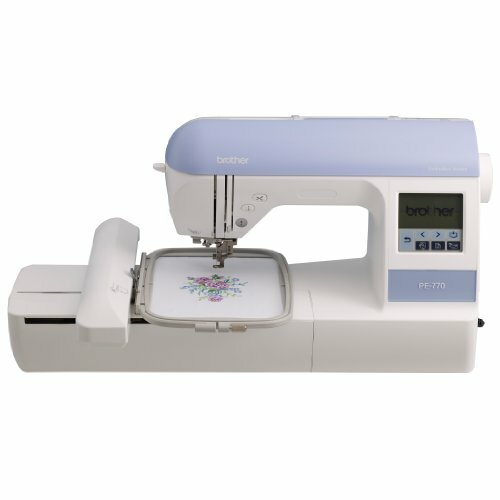 You don’t need to be connected to the Singer Future embroidery machine as it comes with a USB key that helps you edit your embroidery designs. The machine is also compatible with a wide variety of design files. It comes with a software so it’s easy for you to create, scan and edit images before stitching. 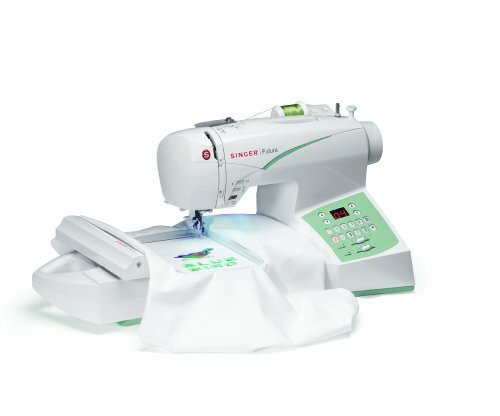 The machine features also drop&sew bobbin system and a swift smart threading system that give you speed and efficiency when working. The issues aren’t deal breakers for us and we consider the machine to be a great tool for embroidery your tablecloths and more. If you are determined to go shopping only once, getting an embroidery machine that is also good on sewing is a wise choice. The Singer CE-100 Futura Sewing and Embroidery Machine comes with many features that ensure good performances for sewing and embroidery just as well. The machine may be used with your computer for the embroidery. 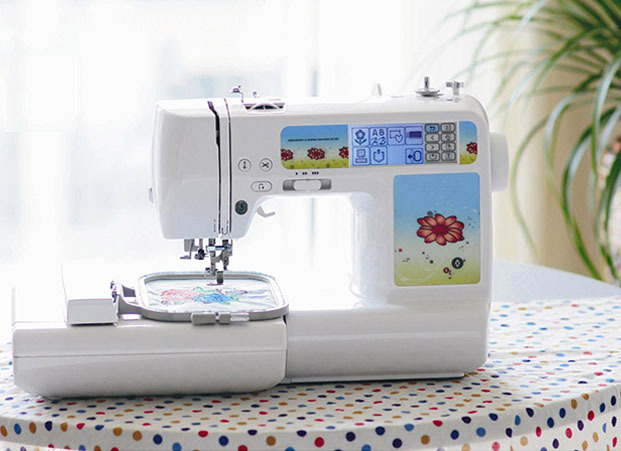 The electronic sewing machine feature includes 22 built-in stitches, 80 stitch functions so you may use it for quilting, decorative, décor sewing and much more. The machine comes with a built-in needle threader so you may thread the needle with just one move. The features for sewing are so many and functional: programmable needle up/down, power control (you get more piercing power when sewing heavyweight fabrics). You easily select the stitch with just one finger and choose from the two styles of one-step buttonholes. We also need to remind the top drop-in bobbin with see-through cover and the drop feed you get to use free hand embroidery, monogramming and stippling. When we go through the embroidery features, we see the machine is compatible with Windows 98 and up. You get 60 built-in designs and 60 “bonus” designs also. The machine comes with a large and a small hoop, which makes it more versatile. The tutorial that comes along is great for the beginning, just the way it is the customer support web site. You may download designs online or from a collection on CD. The designs are easily imported to the machine. The machine is easy to use and it’s compatible with all embroidery formats. It displays the number of colors and the stitching sequence. You get to see your next stitches with just a click of your mouse. The minimal flaws don’t take away the value of the machine that brings to the table reliable performances for sewing and embroidery altogether. 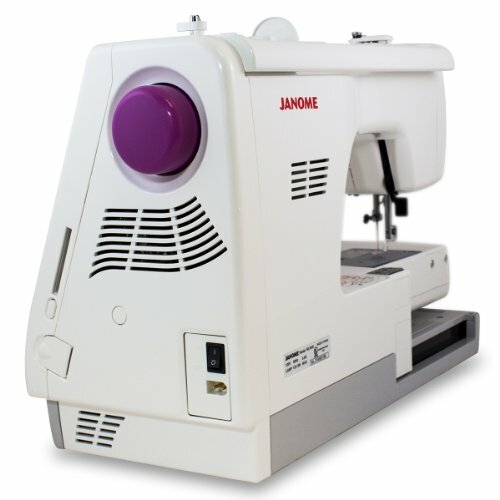 For those of you who are really into embroidery, a reliable and easy to use machine is the Janome 350E Memory Craft Embroidery Machine. There are many great things related to the machine and its versatility is one of them. The machine is easy to use even by a new-entry level hobbyist, but also performant for professional use also. The machine comes with no less than 100 built-in designs, 3 fonts and monogramming options (2 and 3 letter). The embroidery area is rather large, up to 5.5”x7.9”. The variety of your designs may be increased as you can transfer designs using USB and ATA PC card. The machine works fast and increases your efficiency as it has a sewing speed that goes up to 650spm. The backlit LCD touch screen display is clear, responsive and user friendly. You may work on your future designs thanks to the on-screen editing functions that help you turnover, drag, drop, zoom, enlarge or reduce the designs. The built-in needle threader give you speed, whereas the bright LED lights make the machine easier to use. The embroidery foot increases the comfort on use and the ruler decal stamped on the front is highly functional. Let’s not forget the automatic thread cutter and the top loading full rotary hook bobbin that make the machine well thought out and highly functional. You don’t need no external attachment to create accurate embroidery and the machine is dependable when you want to embellish various garments, accessories. And, its expanded built-in memory simplifies your future projects. The list of features is long and we also need to mentions the upper thread and presser foot sensors, the manual thread tension control, the ball bearing precision, the stitch counter or the stitch-out time indicator. The minimal drawbacks don’t lower the overall quality of the embroidery machine that is easy to use, versatile and so dependable for multiple projects. 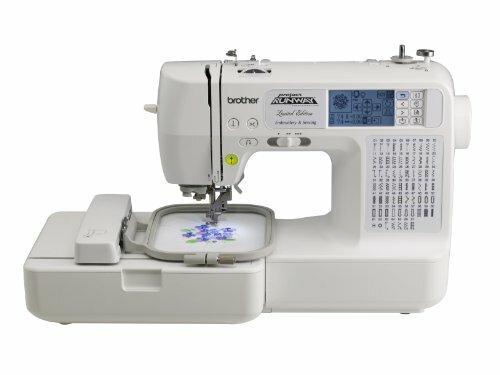 Even though it comes with some limits, the Brother LB6800PRW Project Runway Computerized Embroidery Machine sure compensates and makes it as a dependable option for home use, on any given day. The embroidery machine is sure versatile as it comes with almost 70 (67 in fact) sewing stitches, 70 built-in designs and 120 frame combinations. You may get very creative and the 5 lettering fonts increase the variety of your designs. The machine may be connected to your computer and it’s iBroidery.com compatible or other sites. You may import several designs from those sites, but also from your PC or Brother Memory card. In addition, let’s not forget you may update its software from time to time also. The embroidery hoop is 4”x4” and the machine presents 7 specialty-sewing feet. The threading is easy on top thread and bobbin also and the stitching is consistent and even. 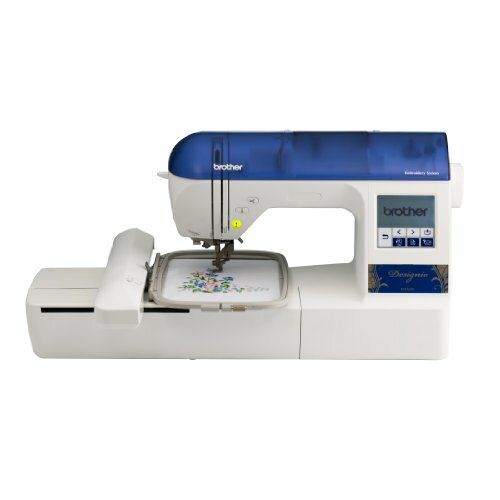 The one-touch automatic thread cutter easily cuts top and bobbin thread. The backlit LCD display is easy to use and responsive. You may also edit your designs (roll, increase/decrease) and see it before stitching on the big LCD touch screen display. The machine comes with a designer rolling bag, USB cable and a protective soft cover. 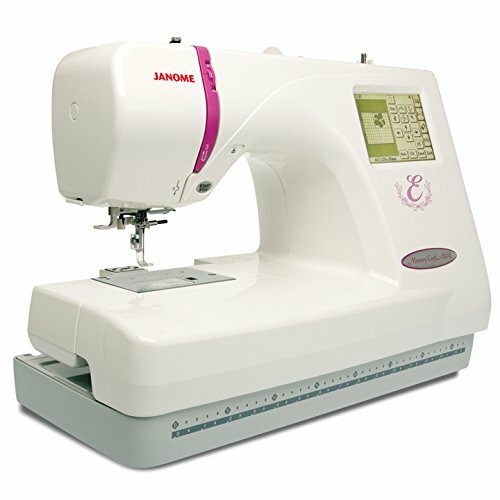 It’s easy to use and the sewing is also efficient and reliable. Despite the minimal flaws, it’s important to know you’re not buying a lemon, but a dependable, versatile and durable embroidery and sewing machine altogether. When you’re on a tight budget but still want a reliable, good quality embroidery machine, play it safe with a machine like the Brother PE540D 4×4 Embroidery Machine. The machine is great to have especially if you have kids or like Disney designs as it comes with 35 built-in Disney embroidery designs. However, it’s not only Disney designs that you can stitch with the machine, but also so many other various designs. The Brother PE 540D comes with 70 decorative designs, 5 embroidery-lettering fonts and plenty of frame patterns combinations (120 to be more precise). You may connect the machine to your computer and increase the variety of your designs by importing other embroidery designs from iBrodery.com. You also get the update your machine from time to time. The machine is easy to use and it presents many features that help you on that. The backlit LCD touch screen display is clear, easy to use and displays nicely your designs. The built-in tutorials guide you in the beginning and minimize your learning curve. The automatic needle thread gives you speed and increase your efficiency. The 4”x4” embroidery area is big enough for small projects at home. The machine has a good build and comes with many useful accessories and tools. It runs smooth and is dependable for quite some time. As long as you know its limits, the machine is a good option for your embroidery projects at home, especially if there are some kids involved. For those of you who are dedicated to embroidery enough to start your own home business, having a dependable and power-horse embroidery machine is welcome anytime. The Brother Designio Series DZ820E Embroidery Machine presents plenty of features that give you efficiency and speed on your jobs, but also has a strong build that takes the intense use. The machine gives you so many design ideas and comes with 136 built-in embroidery designs and 6 lettering fonts. The 120 frame patter combinations sure increase the variety of options when designing and embroidery. The machine is easy to use and the built-in tutorials sure lower a possible learning curve. The backlit LCD touch screen display is monochrome, easy to use, read, and very responsive. You get a full set of designer accessories with the machine and 200 embroidery designs on a CD. Let’s not forget the machine is also iBrodery.com compatible so you get even more options for designing (more than 5,000 designs to be more precise). 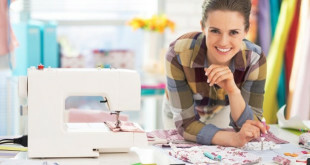 The features that ease the use on the machine are important: the needle threading system that is automatic (this gives you speed and efficiency), the automatic thread trimming (your products look nice every time). The machine is jam resistant and the quickset drop-in top bobbin is reliable. The low bobbin thread indicator is of great use also. Your working areas is always well lit thanks to the bright built-in lights. You may store your favorite projects in the built-in memory pockets and import with the built-in USB port. The machine comes with a second set of embroidery hoops so you may start a new project, while working on another. You also receive 6 spools of high quality embroidery thread and various accessories. All in all, for the money you pay, you get a machine that takes the embroidery to a new level, ready for the home business needs.